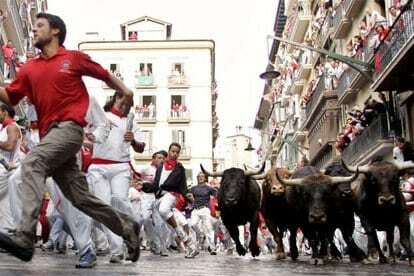 A YOUNG Australian tourist has been gored at Pamplona during the annual ‘Running of the Bulls’. Mitch Davie, 24, from the Australia’s Gold Coast had made it into the bullring at the end of the run, but then slipped and fell right in front of one of the massive bulls. The bull pierced his leg and femoral artery while pinning him to the ground before other runners and matadors rushed in to help him. The Aussie is in hospital in a serious condition and lucky to be alive. The incident highlights the danger of the Spanish festival, where many people are injured each year.